You don’t have to be Finnish to be a Finnish nationalist. Home 2019 April 7 You don’t have to be Finnish to be a Finnish nationalist. German musicology was the dominant school leading into the 19th century; all composers more or less followed the same general rules for harmony and phrasing. The great architect of Western musical canon, Johann Sebastian Bach, set the precedent for the dominance of the German style. Orchestras and instrumentation may have grown more complex, but the same basic guidelines remained mostly intact until the early 20th century. Germany also enjoyed political superiority and unity during the latter half of the 19th century, when nationalist romantic music really began to take off. The idea of a united Germany shares part of a philosophical foundation with smaller nations that had continuously been persecuted, bullied, and assimilated by the larger empires. These nations sought unification and political autonomy of their own, but on an admittedly smaller and less-successful basis. Finland suffered quite a bit under Russian rule. A composer working around the same time as Grieg in Finland demonstrated that one’s heritage need not dictate one’s sense of national identity. Jean Sibelius’ only inherent connection to Finland is his birth there, as he was born into a Swedish family and came of age under the yoke of Russian rule. Upon reaching intellectual maturity, he increasingly identified as a Finn, working hard on his command of the Finnish language and marrying into a prominent Finnish family. Like Grieg, he studied pre-modern Finnish mythology in addition to the folk culture. He became associated with the nationalist movement because of the extensive incorporation of the folk culture into his music. 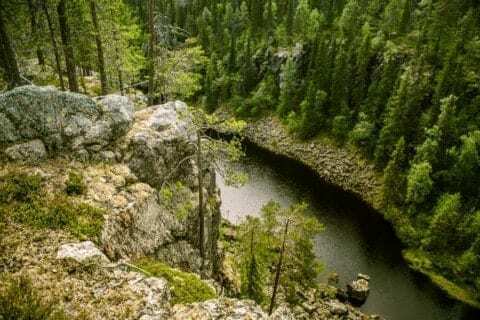 Finlandia–Sibelius’ magnum opus tone poem and clearest example of his infatuation with Finnish culture–depicts the best moments from Finnish myth and history. This musical highlight reel, including everything from the Kalevala’s wisest demigod Väinämöinen to the Thirty Years War, served to endorse the Finnish national press at a time when it was most limited. Russia initially annexed Finland (the “Grand Duchy” under their rule) as a buffer against the Swedes, and it remained annexed until WWI. Tsar Aleksandr III and his son Nicholas II’s “Russification” policy, implemented as a response to unpopularity in the motherland and waning power abroad, sought to silence any national character that was not explicitly Russian. As such, the composition and extensive playing of this work (often under less-egregious titles) really was an act of rebellion against the whole of Russian rule, which ended in 1917 with a parliamentary decree. Regardless of origin or inspiration, there is not question that the music of these composers lives on in concert halls across the world. It is still studied voraciously as a part of a rich cultural and political history in Europe, and the influence of folk culture is in many cases indisputable. Its endorsement of the intelligentsia over centuries enabled the peasant and folk traditions endemic to rich cultural landscapes to remain intact despite rapid modernization. In this way, the music of the romantic era is a time capsule not only to the time of its invention, but as far back as the creation of the land which inspired it. You don’t have to be Finnish to be a Finnish nationalist. by Christopher is licensed under a Creative Commons Attribution-ShareAlike 4.0 International License.